Who are we open to? We are open to students, staff and public, operating on an induction basis only, due to no permanent staff in the wall. There must be a minimum of two people in the wall at any one time. Unless there is a minimum of two, we cannot allow people in due to health and safety reasons. All skill courses are delivered by qualified/trained staff and provided through Teesside University. * All skills and NGB courses are led by qualified and trained instructors. 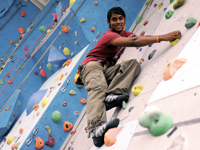 For more information about the climbing wall or any of our outdoor activities contact Callum Anderson on 01642 342267, or email c.anderson@tees.ac.uk. Monday and Wednesday evenings, 6.00pm-9.00pm, and Sunday afternoons, 4.30pm-8.00pm, are for Teesside University Climbing Club only. Induction times are 6.00pm-9.00pm on Tuesday, Wednesday and Thursday evenings.